The news is finally out. Reformation teamed up with NYC-based brand La Ligne to design a small collection of sweaters that are completely sustainable. Today, Ref has been boasting in its newsletter, on social media, and beyond. "The sweaters are all made from 100% recycled yarns from Prato, Italy, using things like discarded plastic bottles, industrial waste and used denim cuts. It looks (and feels) way better than it sounds," the brand writes. You know those sweaters you always crave come fall but have a tough time pinning down? Well, now they can be found at Reformation thanks to this exciting new collaboration. "Marrying La Ligne's classic yet modern style and dedication to all things striped with Reformation's commitment to sustainable fashion (100% recycled fibers made these! ), the collaboration seamlessly embodies the values and style of both brands. 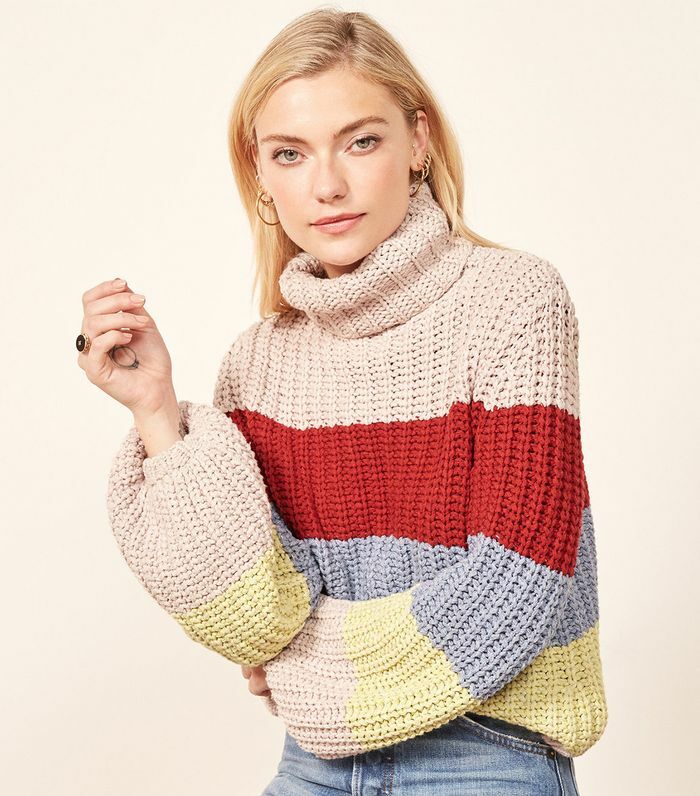 Sweaters are a La Ligne signature and now have been translated into Reformation girl silhouettes (read: slightly more cropped, feminine sleeves, etc.) just in time for fall," Reformation tells us. In true Reformation fashion, the sweaters are shown styled with perfectly fitted vintage-inspired denim and a pair of fall 2018's It shoes. If you haven't quite accepted the fall season, one glance at this new collection will have you ready for sweater weather in no time. Go on to shop the new Reformation x La Ligne sustainable sweater collection. Next up, shop the brands designing the next It shoes.